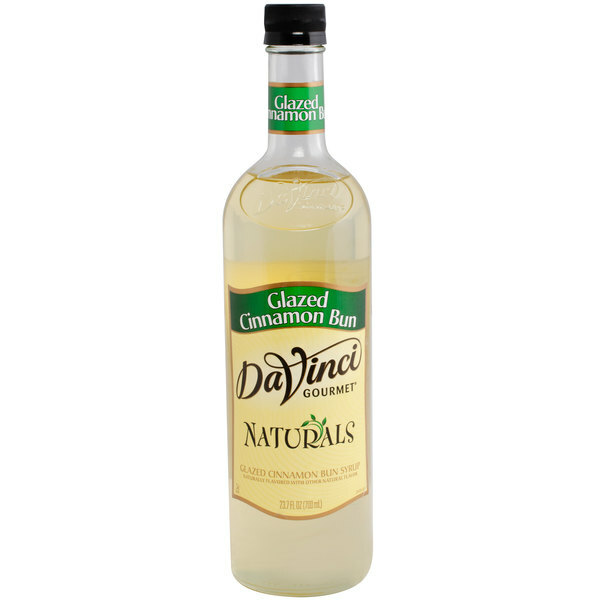 DaVinci Gourmet all natural flavoring syrups, like this glazed cinnamon bun syrup, are naturally delicious, providing consistent quality flavor without the artificial flavors, colors, or preservatives! 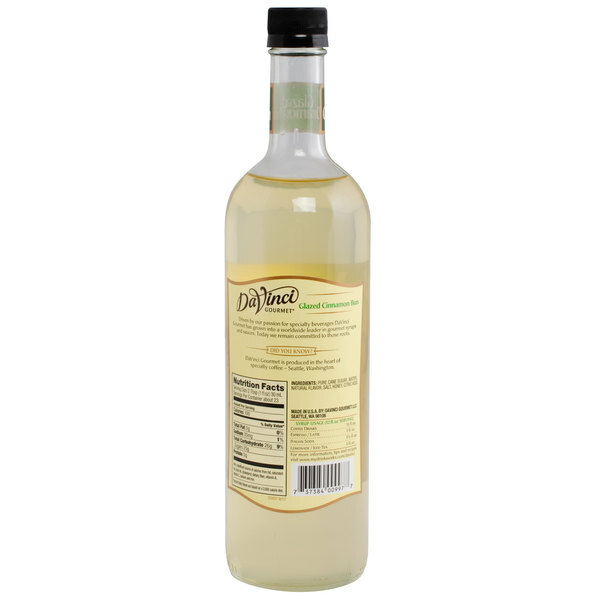 Made with pure cane sugar, this flavoring syrup is perfect for adding sweetness to your signature coffee drinks, hot cocoa, shakes, and desserts. Since it is shelf stable, you can proudly display this all-natural product along your bar or counter. Featuring a flavor blend of cinnamon roll glazed with vanilla cream cheese frosting, this glazed cinnamon bun flavoring syrup enhances the aroma and taste of any drink or dish without imparting any artificial color. Use the glazed cinnamon bun flavor in a variety hot, cold, or blended drinks to add a deliciously sweet bakery notes to your drinks. Mix it with chocolate or vanilla for indulgent milkshakes, or try using it with other baking ingredients to quickly and easily enhance and create signature dessert recipes. One splash of flavoring syrup goes a long way, and flavored beverages made from this flavoring syrup enhance your menu with new and appealing, all-natural items! This user-friendly glass bottle is easy for your baristas and restaurant staff to handle. 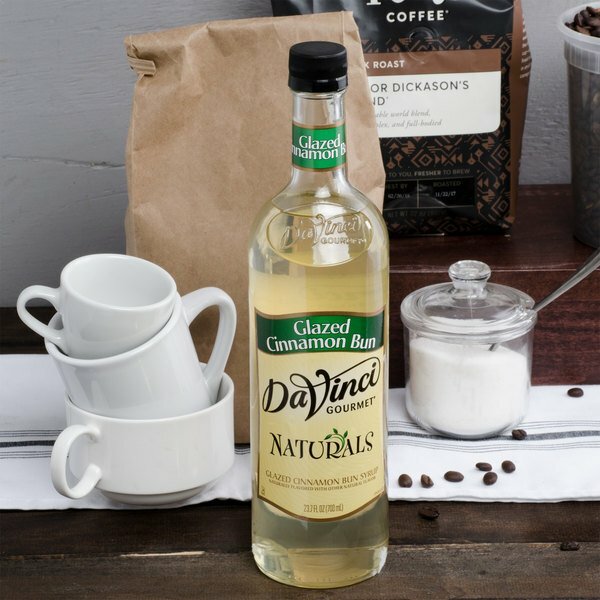 Sold in gourmet coffee shops, specialty food stores, food service outlets, and grocery stores, DaVinci Gourmet products, like this all-natural glazed cinnamon bun syrup, have a long history of commitment to quality and superior taste. This syrup is absolutely delicious!! You need to try it. We used it along with a fruit flavor for an espresso drink. It tasted like a streusel coffee cake. Amazing. My favorite DaVinci syrup so far!! True to its taste Monin brings us another great tasting syrup. Although not a strong as I would like for it to be this glazed cinnamon bun is supremely delicious. Use in all your favorite recipes, coffees & Lattes.